After a confusing couple of weeks, Satomi’s vision was finally retested by our Neuro-Optometrist. In some cases the improvement is distinct but in others, things look a bit worse. Firstly, that funny pear sketch. As you can see from the date, the top scribble is from back in May. It shows a distinct divergence in her vision. The lower scribble is from today and is definitely improved. 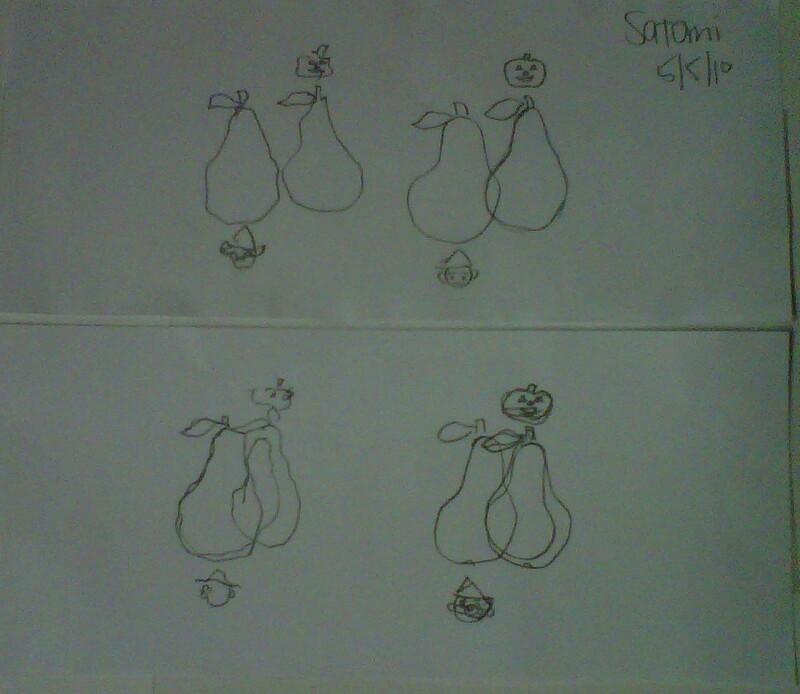 Remember that the ideal sketch will just show two pears next to each other. In my last Vision Therapy post, I mentioned that Satomi performed this test flawlessly in “practice” sessions. That may be completely true because the “practice” equipment is not the “test” equipment. A small deviation in setup could result in this variation. What is important is that there is marked improvement. 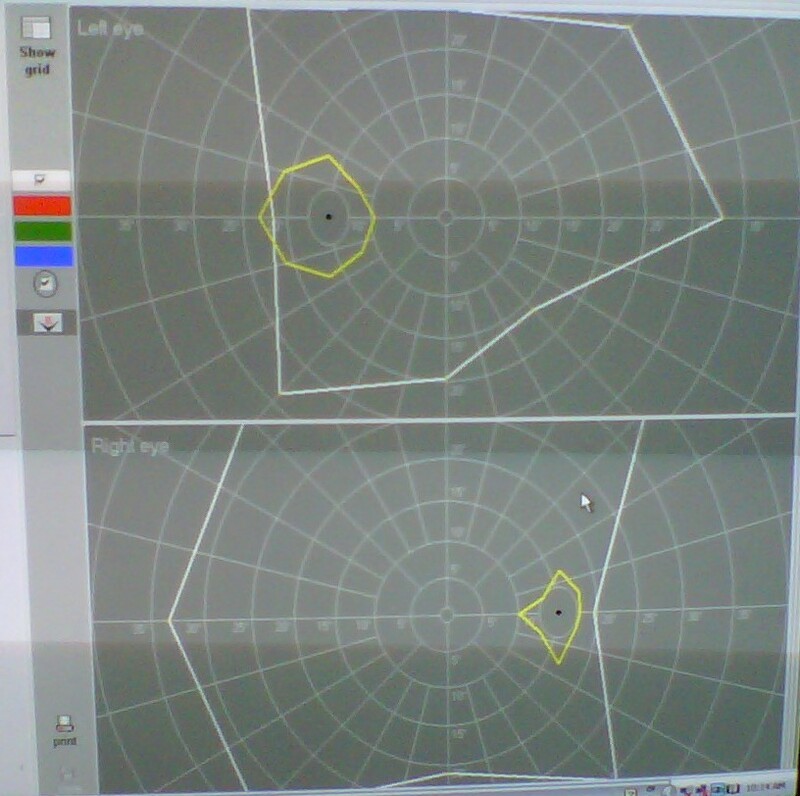 These next graphs are her peripheral vision results. Again, here are the results from May. And here are her July results. Her right eye has noticable improvement in all colors but her left eye is a bit worse by the same margin. We’re not sure what to make of this. 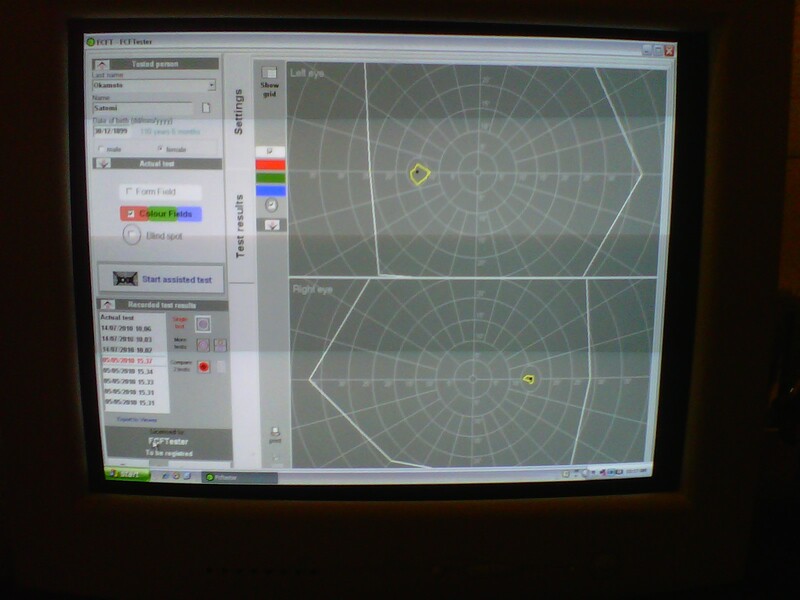 Here are some tests I hadn’t included before: Blind spot tests. The doctor pointed them out specifically because of the obvious change. I’m told that these results are very good especially by someone with Satomi’s history. Here are her July results. These results were surprising and basically unexplanable. 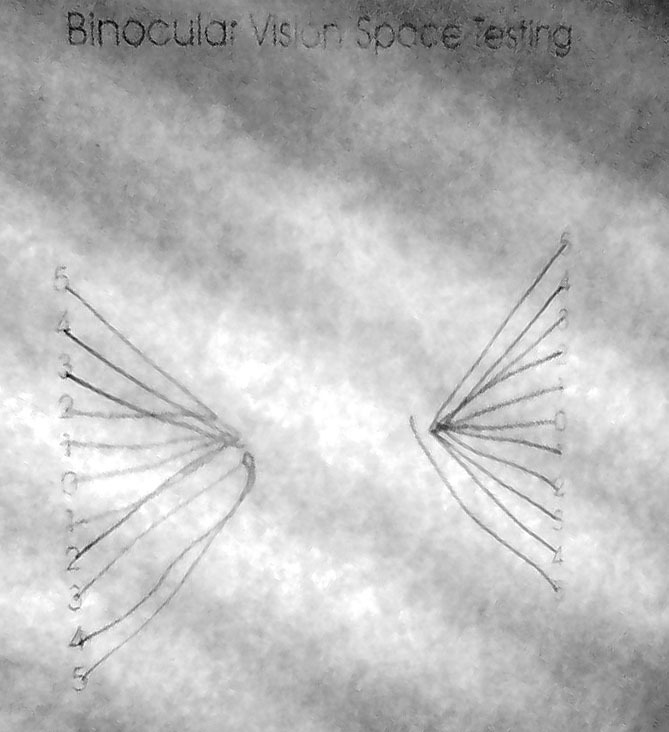 Finally, here is another new test: Binocular Spacial Perception. I included it here because it is a clear example of Satomi’s left-right issues. In this test Satomi has a pencil in each hand. She is to concurrently draw lines from each set of numbers (5 to 5, 4 to 4, etc.) to a “perceived” central point on the paper. 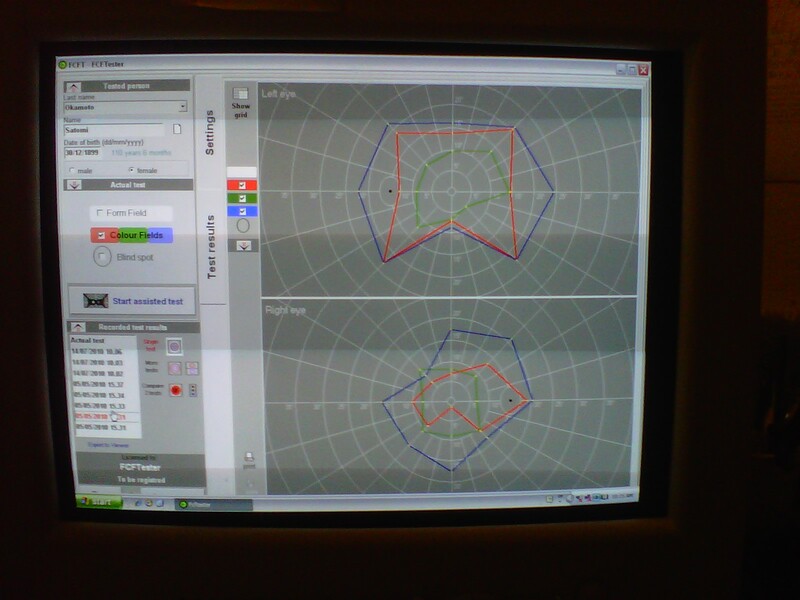 A set of lenses distorts her vision so that the “perceived” central point is actually two points, an inch apart. What is important is the shape of the point. As you can see on the right, Satomi ends at a sharp point, indicating that her perception of the fixed point is quite clear. On the left, the lines end in a rounded blunt point, indicating that she needs to self-correct as the pencil nears the point. Her perception of the fixed point is skewed. As I mentioned before, the results were mixed-some improvement and some worsening. We are assured that it is not uncommon that some aspects of vision may worsen before improvement. Satomi accepts it as a normal medical occurence but it just doesn’t give me the warm-and-fuzzys. Based on these results, the doctor will be changing Satomi’s therapy plan. 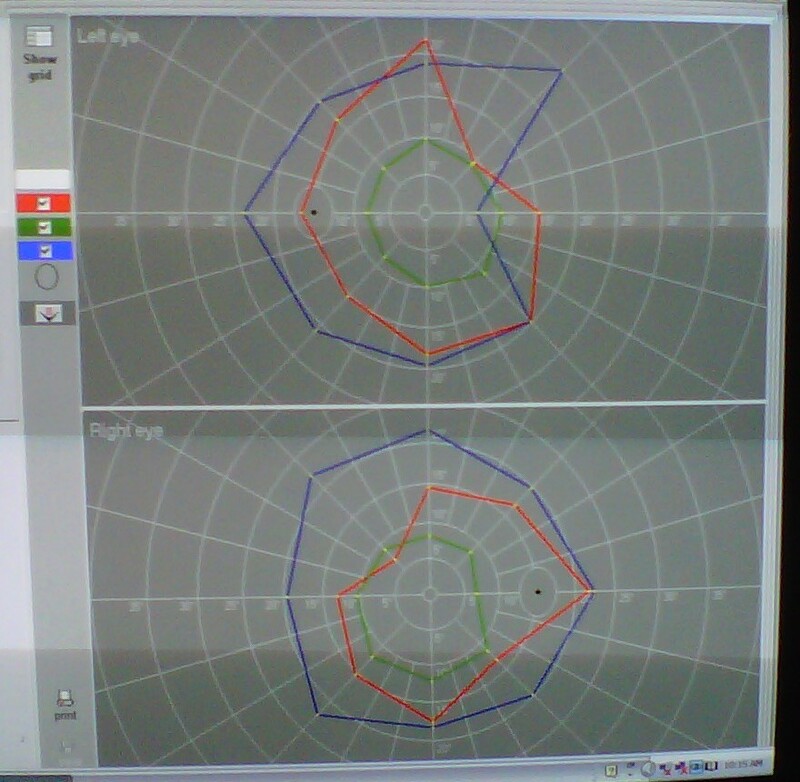 These results show that her monocular eye performance is a problem. Our focus (excuse the pun) will now be on each eye individually before continuing treatment of her binocular conditions. We’re going to continue therapy and retest again in a 2 to 3 months.